Thank you for volunteering! It seems that the world does not go around without a few necessary items, like money, food, … however, I want to add one item to the list. That is volunteers. Without a strong core of volunteers there will be no club activities, especially rides. Complimentary, all-you-can eat brunch during the annual WCBC Volunteer Appreciation Brunch & Ride (held in October; look for details on the WCBC’s website home page). A “WCBC Ride Leader” jersey, custom-designed annually or other appropriate award will be presented at our annual banquet in February. See or contact the Ride Captain for more details. Please print this out and carry the sheet on the ride. WCBC Accident Report Form (PDF). Please complete this form ASAP. 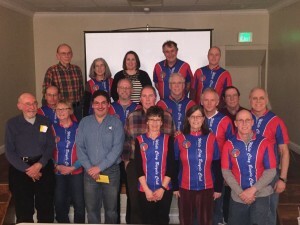 Many of the 42 Ride Leaders who qualified for the 2015 Ride Leader Award (either a jersey or a gift card) were able to attend the WCBC Banquet on February 27th. Thanks to Karl Hassler for providing this photograph of those ride leaders. If any of you are interested in becoming Ride Leaders, check the WCBC Calendar for details about the Ride Leader Training that will be held on March 19th. We’d love to have you join us.